After a summer full of sizzling-hot days, the season of Fall is so welcome…with its cooler temperatures, beautiful yellow and red leaves, football and pumpkins. But along with the nice weather comes a very full schedule with school, homework, sports practices, holidays, and on and on. It’s not easy to jump right back into the busyness after months of summer laziness. Sometimes, it seems that just getting ready in the mornings and out the door on time is a chore. 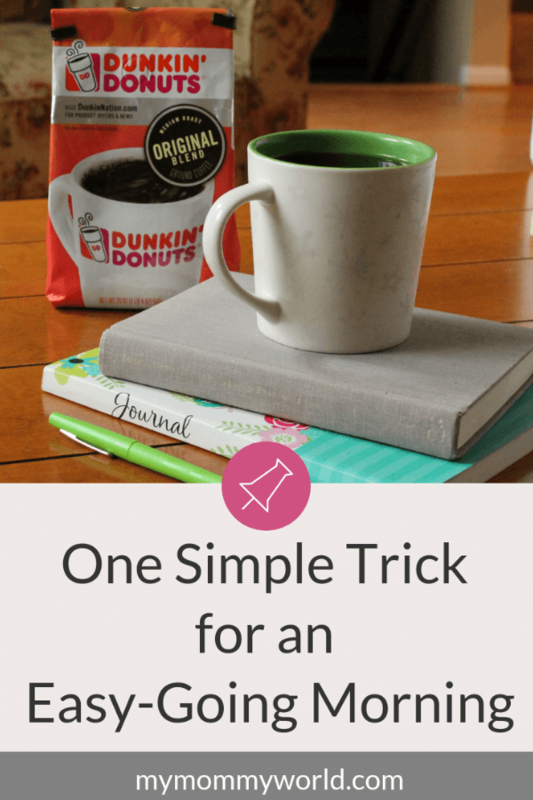 That’s why I rely on this one simple trick to transform our mornings from hectic to easy-going. What is this easy little trick that saves my sanity on a regular basis? Getting up earlier than my kids and using that time to plan my day. Setting up your morning routine with a little extra time before your day officially has to start will pay off big time…not only for your peace of mind, but for your kids too. How can I make my morning routine easier? Creating a morning routine is a great thing because not only does it help your kids know what to expect, but it helps you organize your time and all the school gear that you and your family need to carry along. But adding in a few minutes of quiet before you have to start getting ready for the day helps to make that morning routine a lot easier. Waking up earlier than your kids not only ensures that you don’t oversleep your alarm, but it gives you some time to think and plan. When you have a good chunk of time to ease yourself into the day, it’s easier to adjust from a state of sleep because you don’t have to jump right into the busyness as soon as you get out of bed. The first thing I do when I get up in the mornings is to make a cup of coffee. I then sit down in the quiet for 30-45 minutes to read and journal while I drink my coffee, and it’s really the best part of the day. How can I get motivated to get up early? Getting up before the kids isn’t always easy, especially if you are a night owl or have a really early start in the mornings. But I find that I enjoy having a chunk of time to myself that is quiet, without anyone needing me. It also allows me the time to write in a journal and read the books that that I’ve been wanting to read — the things that never get done if I wait until the end of the day. But what entices me out of bed in the morning is the idea of a cup of good coffee..that is actually HOT…and being able to enjoy it while I sit and relax before the busy day begins. 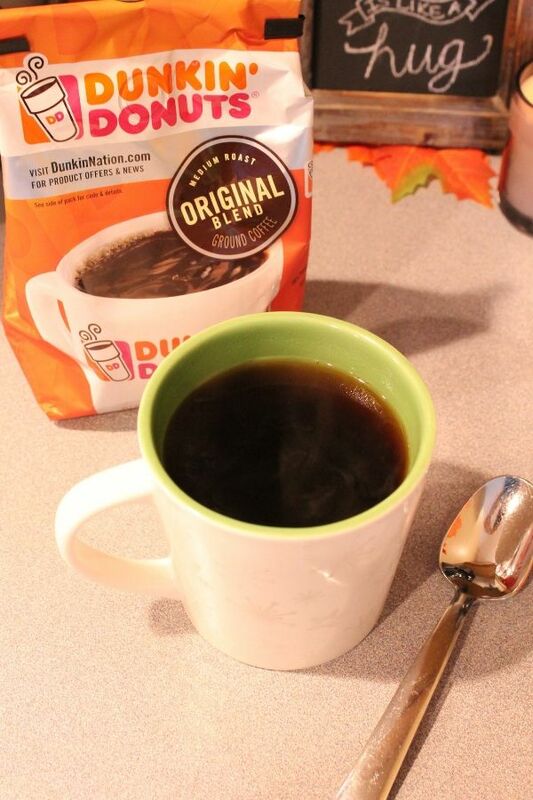 Dunkin’ Donuts Original Blend Coffee is my favorite, because it’s a trustworthy coffee that gives me that little boost in the morning to help me get through the day. If you’re anything like me, you just want a good tasting cup of coffee to start out your mornings. You don’t want to take the time to figure out the difference between country of origin or light vs. dark roasts…you just want something that is dependable and tastes good. That’s why I pick Dunkin’ Donuts…it’s always good. Right now, you can save $1.25 on any Dunkin’ Donuts® Coffee Product starting 9/16 available on Dunkin Donuts coffee at Giant stores. With this valuable coupon, I can stock up to make sure I always have my favorite coffee on hand. Another thing that I recently did to make my mornings flow even more smoothly was to make a coffee bar for myself. It has helped me make coffee more quickly in the mornings because all my coffee supplies are in one place and are better organized. My little coffee bar also made a little corner of my kitchen prettier, since I got to incorporate some fun farmhouse-style pieces into the design. You too can make a kitchen coffee bar, even if you only have a small corner of the kitchen counter to spare. First, you’ll want to pick out a spot in your kitchen where you can place all your coffee-making supplies. I am using the bit of countertop between the sink and the wall in my kitchen, and it’s just enough space for a coffeemaker, a tray and a cute sign. It’s also right underneath the cabinet that holds all my coffee mugs for easy access. I found my tiered tray at a local craft store. Not only is it a pretty farmhouse style, but it is also very functional, with trays that spin and compartments for holding all my stuff. I’ve decorated my tray with some fun Fall-themed accessories, which I change out with the seasons, and added some small canisters to hold my ground coffee and sweeteners. In addition to the coffee maker, I’ve also added a fun chalkboard sign, onto which I drew a coffee-themed design with a chalk pencil. This sign is just so much fun and brings the space some cheer. 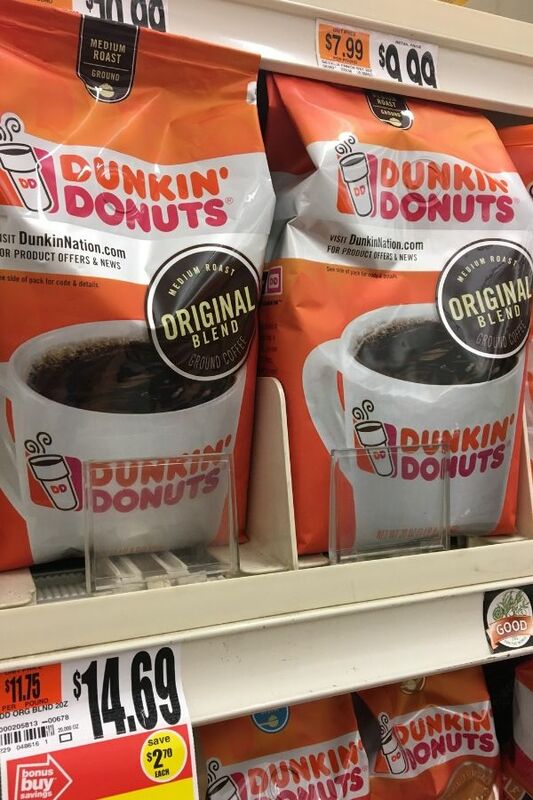 I filled up the coffee canister with my favorite Dunkin’ Donuts Original Blend coffee, made sure I have enough filters on hand. Now it’s easy to make a fresh cup of coffee in the mornings! Savoring a hot cup of coffee in the mornings with some quiet helps me to start the day off on the right foot. With that boost I receive from my good ol’ Dunkin’ Donuts, I’m ready to tackle school lunches, breakfast-making, packing backpacks and getting everyone out the door on time. I love your coffee bar idea. It makes it so nice to have everything together in one place. The sign is so cute too.